(Thunderous applause)...Well, my throat is not good (Hoon Mo Nim was suffering from a rather severe sore throat and could barely speak above a near whisper) so I can't speak well. Please listen well. I am grateful for members to come to Chung Pyung. You receive much grace. You believed in Chung Pyung Works. I know you came for such blessing; I offered so much devotion so that you could receive blessing. I was afraid you might come and not receive anything, so I made effort. My heart is so warm right now, to you. I think until when do I have to do this to take out fallen nature so deep inside. It must be removed. That is my heart. It seems impossible to completely remove everything. But, I see people removing fallen nature. I feel it is possible. The Absolute Good Spirits are truly working to help us. For the Azalea Festival, there were many inconveniences for you. Even the chungshim won was opened for you to sleep. We are going to improve the Chung Pyung training center so you can stay here well. 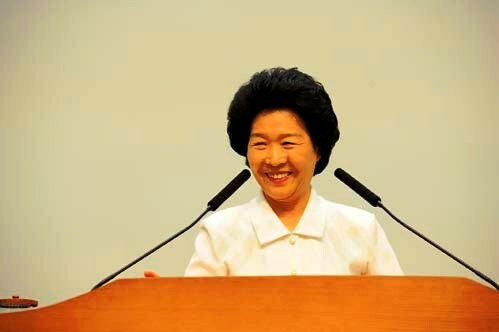 Today, you received True Mother's words (True Mother spoke earlier in the day to national members at the Peace World Center), and True Father's. We must become clan Messiahs. Share Heavenly fortune with everyone; become such members. Let's become victors for 2020. True Father is here. When you sang the church anthem, I was standing up because True Father was there. I could not sit if True Father was there. When I bow to the photo of True parents, True Father is not there, but in Spirit World, but if I bow to the chair, True Father is there (here). I told True Father: I will tell them you are here. True Father: no, don't tell them. True Father is happy that you stayed to the end. True Father: let's be victorious until 2020 is accomplished. Fulfill your responsibility. True Father (to Dae Mo Nim): I will give you 3 days (May 6, 7, 8) (to rest) and then you have to prepare for the summer Special Great Works. So, in 3 days' time, I will begin to prepare for the next Special Great Works! Love of True Mother: for us to complete our portion of responsibility by 2020. Korean members, please be careful when you drive home. Japanese members, you will be leaving tomorrow. Chan yang team, you did really well this time. Become a son or daughter of filial piety, and an eternal member, eternally un-changing. Thank you.